Knox six pack is very good, not exactly trail specific but very comfy and hugging. you can also fit some knox back armor into it. helmet string for when youve stopped. I use a cheap one from Decathlon, (Triborg £20) had it for years... Gets everything in , has a hydration pack holder and is absolutely bulletproof...nearly four years out of mine, chuck it in the washer..like new ! I find that a backpack with decent padded waist straps is very useful. You can take the weight off of your shoulders, and if you get one with pockets on the waist straps, you can store tools in them like the Motion Pro trail and chain multi tools. This keeps the weight down low and means the tools are accessible without even having to take your backpack off. Mine is a Lowe Alpine something or other, around 30-35 litres. Cost £60-70 but worth it. My "son" Joel took my advice for once. These Decathalon rucksacks are exceptional value for money. They are occasionally discounted to £15. I really fail to understand why some people will pay large sums of money for expensive rucksacks - but hey what do I care. 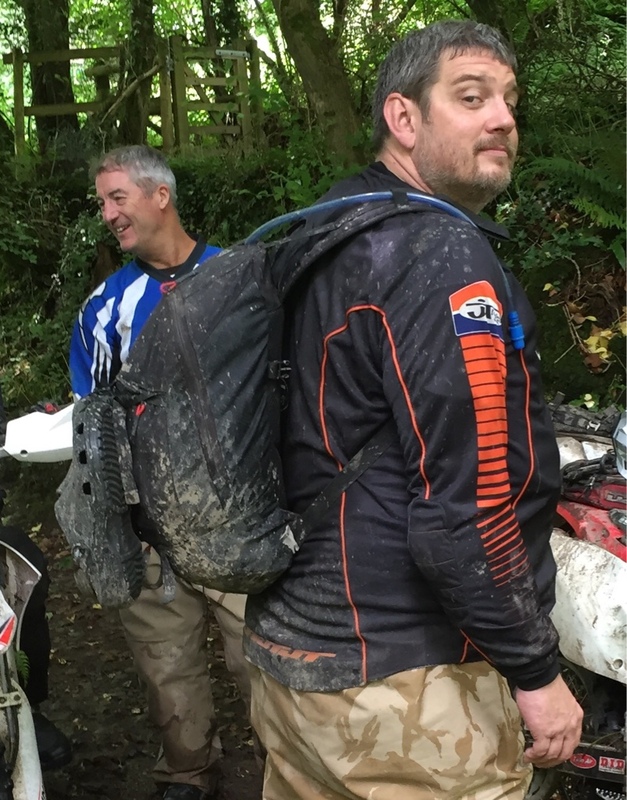 The problem with rucksacks is that they are made to carry gear and some riders who are unaccustomed to carrying any weight on their backs find them heavy/uncomfortable/bulky. May I suggest that heavy items like tools are carried on the bike in some sort of bag - perhaps attached to the rear mudguard or the back of the seat. I sometimes carry a cheap totally waterproof plastic bum bag around my hips which is an excellent place for carrying stuff. We can give you all good quality advice but it is up to each individual to experiment and find what is best for them.